This is a beautiful and spacious 5 bedroom villa, right on the beach for sale. 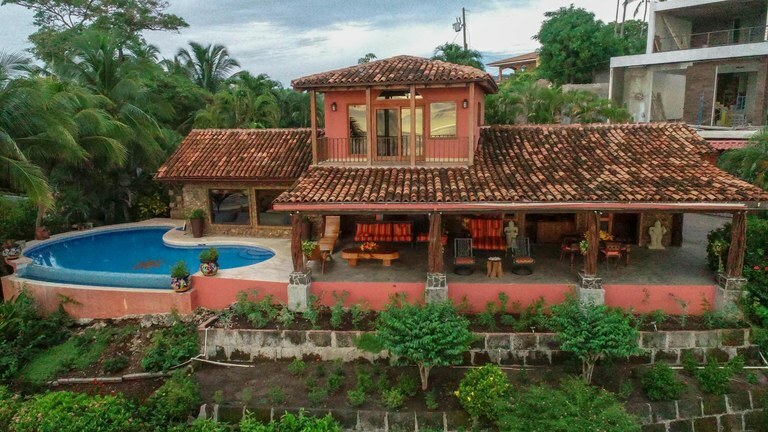 This villa has all the comforts of home, but in tropical Playa Potrero, Costa Rica! The infinity pool looks out over the ocean and is complemented by an outdoor bar with refrigerator, sink and BBQ grill and a huge partially covered terrace with patio furniture for lounging, reading and dining. This home is perfect for retirement or vacation rental income in a perfect location. Area 57 hectares or 140 acres. 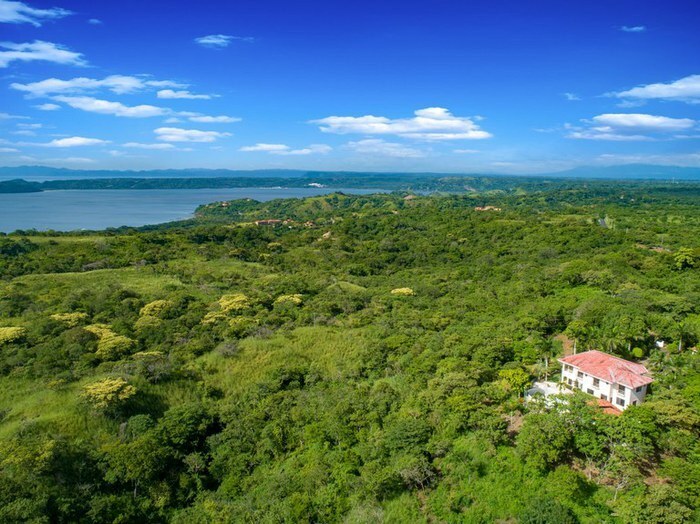 Great opportunity, property located in the best area of Guanacaste, in the Gulf of Papagayo, just three minutes from Playa Panama, with spectacular views of the ocean and the valley. The property has a magnificent natural beauty, where the owners have preserved the flora and fauna of the place, and conditioned a spectacular luxury home, with all the current comforts and where you breathe peace and tranquility. The luxury house has six hundred square meters of construction on two floors, has five bedrooms with their own bathroom each, air conditioning in each room, a large living room, large kitchen, large dining room with air conditioning, laundry room, a large terrace with a beautiful view of the ocean. The house has extensive details and decorations that make it unique. In addition, the property has a private pool, accompanied by a private ranch for events, with BBQ and pizza oven, a private bathroom, garage, a stable and a small guest house or employees, with two bedrooms, bathroom and kitchen. The property, due to its location, size and amenities, is perfect for developing a beach hotel, with ample vegetation and availability of all the required services. An important detail is its own and legalized water well. This house with 5 bedrooms and 5 bathrooms is located in Playa Potrero, Guanacaste Costa Rica, in the county of Santa Cruz. This near the coast property with ocean views is situated in the tropical dry forest of Costa Rica. The land area of this house is 4,322.60 square meter (46,527.89 square feet), and it has a living space of 325.00 square meter (3,498.26 square feet). This house has air conditioning through multiple wall units. This house is available furnished. This property includes a dishwasher, a dryer, a garbage disposal, a grill, a microwave, an oven, a refrigerator, a stove, a stove hood and a washing machine. The property also features an in-ground pool. 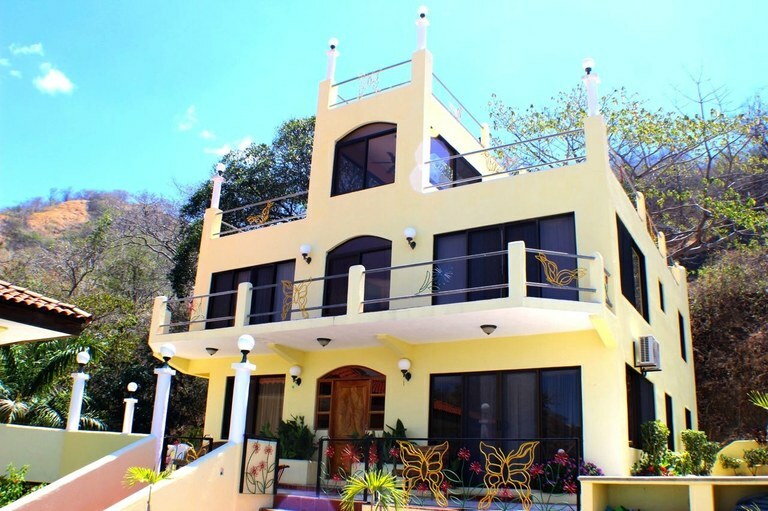 Villa El Sueño de Ocotal is an excellent income-producing opportunity in Playa Ocotal. 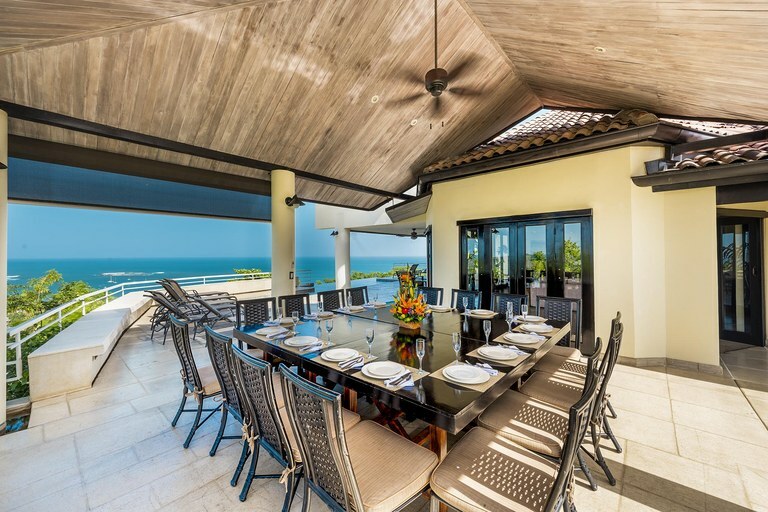 This 4700 sq ft villa with ocean views can sleep up to 20 people. This villa boasts 4 private hotel style rooms. Two of the rooms feature queen-sized beds, tv, mini fridge and sliding glass doors that open to the pool area. Each of the other two rooms feature 2-twin beds, a tv and sliders that open to the pool area. All of the hotel-style rooms have en-suite bathrooms. To complete the first level there is a 1-bedroom apartment with a king-sized bed, equipped kitchen, living area and large veranda. On the second floor of the Villa, there is a large 3-bedroom apartment boasting an open floor plan with a large balcony and lovely ocean views from almost every room in the apartment. This newly renovated 6-Bedroom Penthouse is located in the Oceanica development and on the prestigious North Ridge of Playa Flamingo, where the new $50M marina is scheduled to be built. Oceanica development is highly sought after because of its prime location, and this penthouse is the example of luxury. It is situated within a 2-minute walk to the white sand beach of Playa Flamingo and a 5-minute walk to the proposed marina that is scheduled to break ground this year. Walk from your penthouse to your yacht, and enjoy all that Playa Flamingo has to offer. 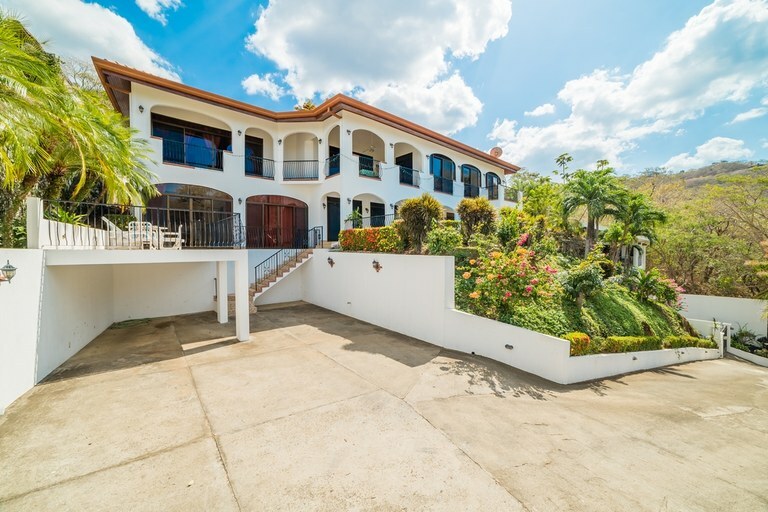 This house with 8 bedrooms and 8 bathrooms is located in Playa Tamarindo, Guanacaste Costa Rica, in the county of Santa Cruz. This near the coast property with ocean view is situated in the tropical dry forest of Costa Rica. The land area of this house is 1.923,00 square meter (20.698,92 square feet), and it has a living space of 613,16 square meter (6.600,01 square feet). This house has air conditioning through multiple wall units. This house is available furnished. This property includes a stove, a freezer, an oven, a washing machine, a dishwasher, a microwave, a refrigerator, a grill, a wine refrigerator and a dryer. The property also features an infinity pool and a private pool. 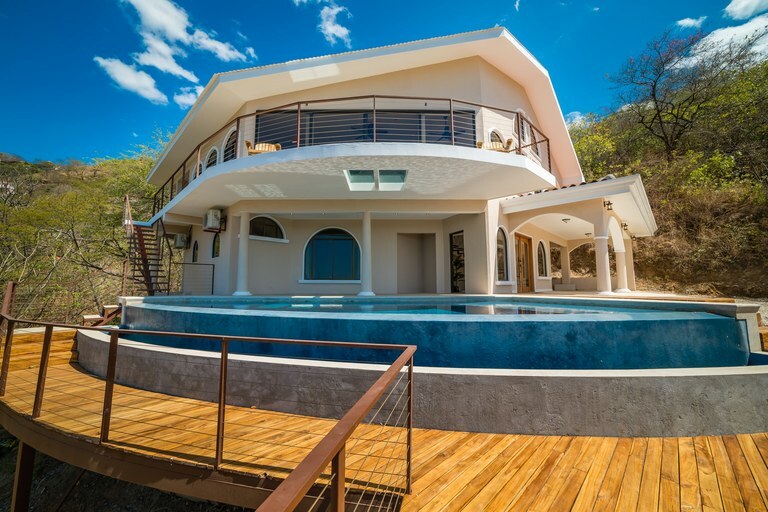 This is a huge, multi-level luxury home in the heart of Tamarindo on Costa Rica’s Gold Coast of Guanacaste. 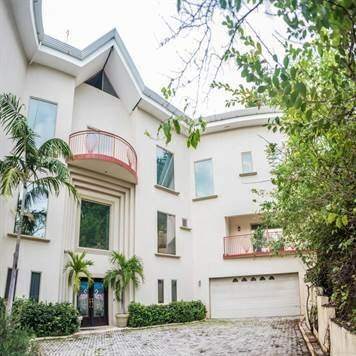 In this tourist hot-spot, this home is an amazing rental performer with this amazing home that accommodates up to 16 guests with 7 bedrooms, and amazing ocean-view, 4th floor master suite, a ocean-view lap pool, tropical gardens, and stunning ocean views from virtually ever part of the home. 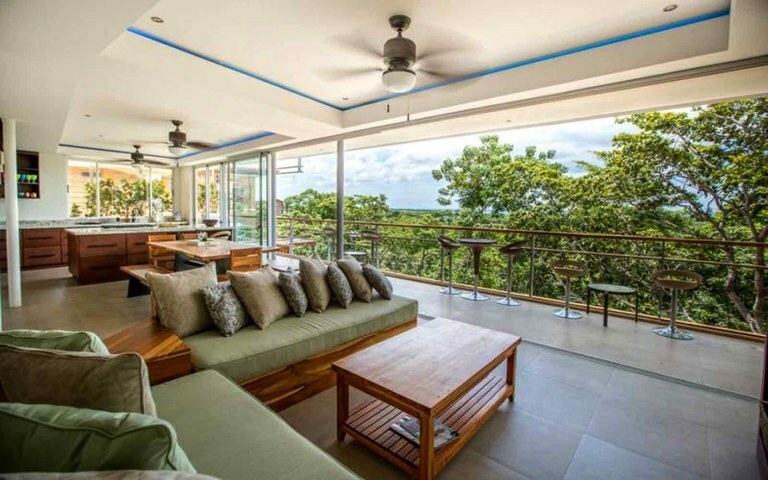 Perched on a west facing hillside, you are up and out of the fray of bustling Tamarindo when you want to be, but never more than a walk away from shops, restaurants, live music and the beaches. 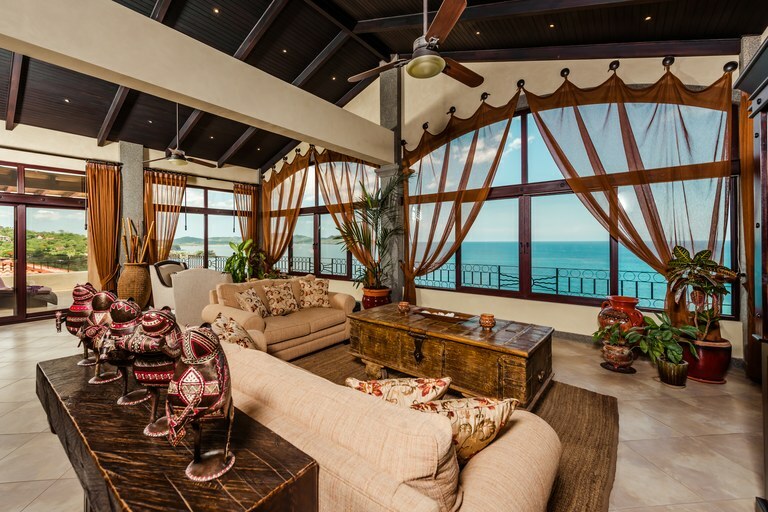 Casa Piedra: Beachfront Perfection On Playa Flamingo! 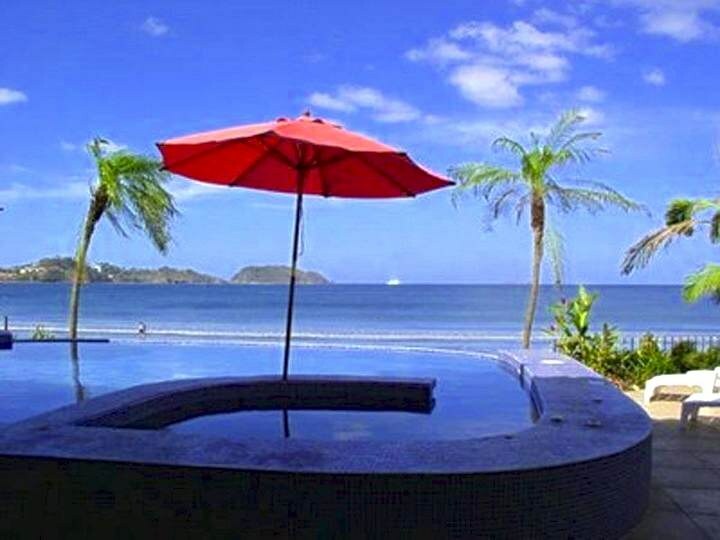 If you’ve been dreaming of owning an oceanfront property in Costa Rica, look no further than Casa Piedra. Whether you’re interested in a full-time residence or a rental property, this spectacular titled beachfront 4 bedroom, 4 bathroom home with 2 bedroom 1 bathroom casita in Playa Flamingo possesses a unique charm you can’t find anywhere else. This fabulous property consist on total of 7 bedrooms and 6.5 bathrooms, including caretakers apartment, guest house and main 3 story home. It even has a large green space and playground, a private pool. Surrounded with great open ocean view decks on each floor, all around the house.